This item is temporarily unavailable, sorry! SKU: TB02. Category: Trackballs and Lightguns. This 2 1/4 inch (57mm) Trackball comes in a compact enclosure and takes up a reasonably small amount of space in your control panel. 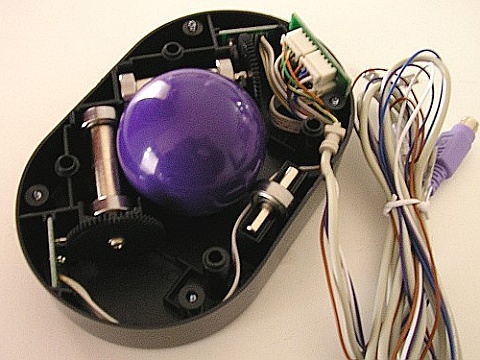 It comes with its own PS/2 interface along with wiring for 3 buttons (note that only 2 buttons may work, depending on the mouse drivers used). Simply plug the cable into the PS/2 mouse port of your computer and it will be detected as a standard mouse. A USB adaptor is also available at a small additional cost, which then allows the trackball to be “hot plugged” into any system that supports USB. 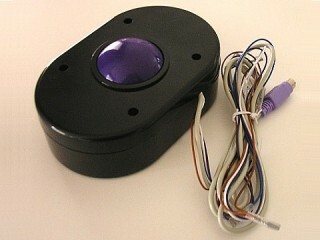 These trackballs are available with a Purple ball only.